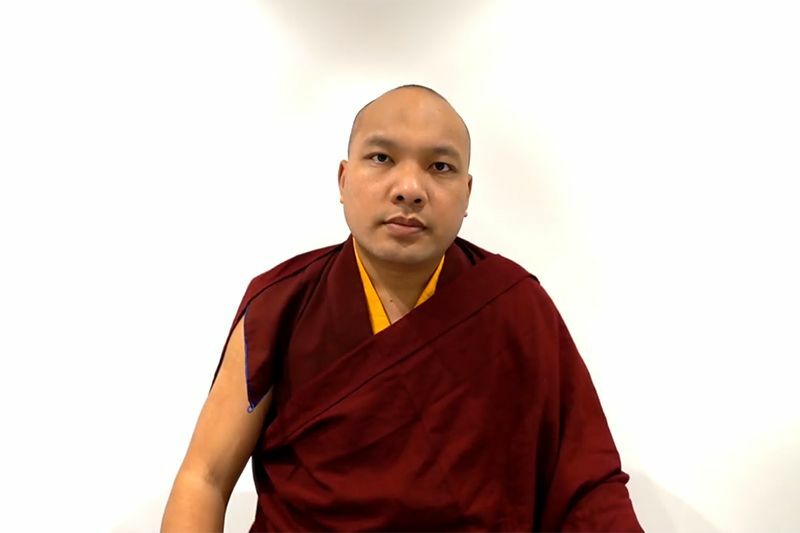 His Holiness Gyalwang Karmapa has said that Akong Tulku Rinpoche showed how it is possible to provide spiritual guidance and to care for the immediate needs of those who are suffering. 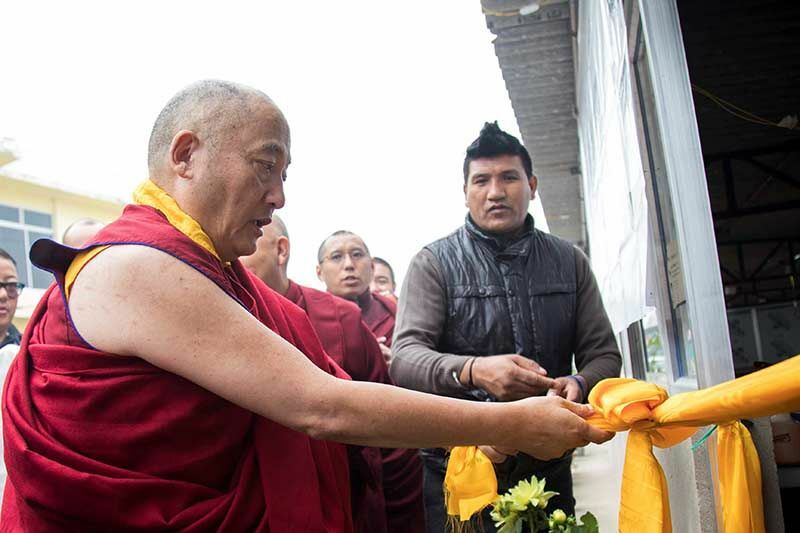 After Akong Rinpoche died in tragic circumstances in 2013, whenever members of the Samye Ling community have requested His Holiness to find the Tulku of their beloved friend and teacher, he has assured them that when the time is right he will find Akong Rinpoche’s reincarnation. 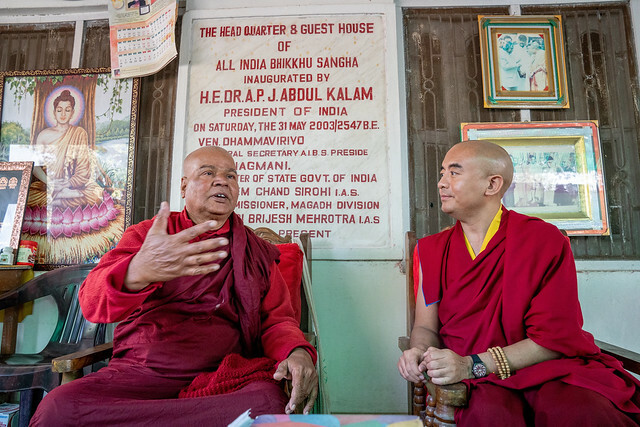 Meanwhile His Holiness has urged anyone connected to Akong Rinpoche to play their part in continuing their teacher’s compassionate activity, and two students of Akong Rinpoche started the Hart Knowe Trust, with this aim. The Hart Knowe Trust works in close co-operation with the Medical Camp organised by the Kagyupa International Trust so that local people can receive nutritious food alongside much needed health care. 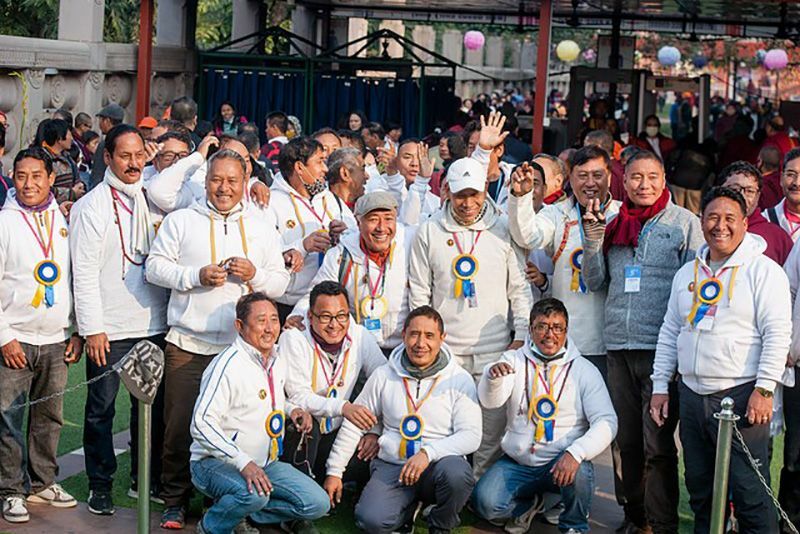 The Soup Kitchen started in 2004 and this year it is again serving hot meals consisting of rice, dhal and vegetables to more than 500 people at lunchtime every day during the Kagyu Monlam. The food is prepared on site at the All India Bikkhu Sangha Centre by cooks and helpers from Tergar Monastery under the direction of Lama Tenzin. Kagyu Monlam participants from all over the world and from all walks of life can volunteer to help serve the food. United by the challenge of a shared purpose, they can express the kindness and compassion that is within us all just waiting to be given the opportunity to shine. At lunchtime on 16th January 2019 the Soup Kitchen was blessed by a special visit from Yongey Mingyur Rinpoche. Although there are so many demands on his time, in a completely calm and unhurried way, he managed to connect with everyone he met. 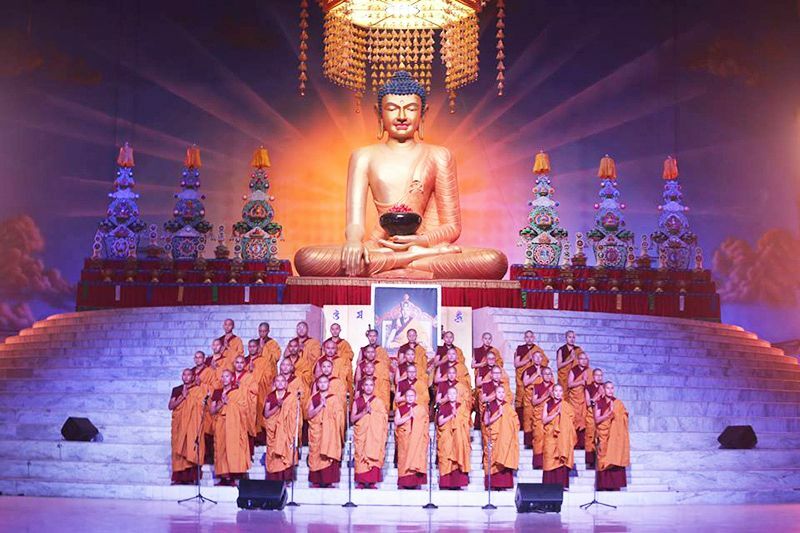 Rinpoche sat and talked with the leader of the All India Bikkhu Centre, Bikkhu Pragya Deep and made aspiration prayers with Sangha members at the feet of the magnificent standing Buddha statue. He blessed the food before serving some of the local people and then sat to sample the food himself, commenting, “This food is better than you can get in restaurants.” The volunteers were thrilled to meet with Mingyur Rinpoche in such an informal way and, before he left for his next meeting, there was time for a group photo with the whole working team. “It felt like we had been given a spontaneous teaching on how to live and work with effortless awareness and joy,” one volunteer commented. Inspired by Rinpoche’s spacious yet down to earth way of being, everything seemed to be flowing well. Just as the food was more or less finished for the day, suddenly a group of 250 schoolchildren who had been to the Medical Camp came to visit the Soup Kitchen. The cooks and volunteers pulled out all the stops to make them welcome, providing chai and biscuits so that the children and their teachers went home happy and relaxed; another worthwhile day at the Akong Tulku Rinpoche Memorial Soup Kitchen. 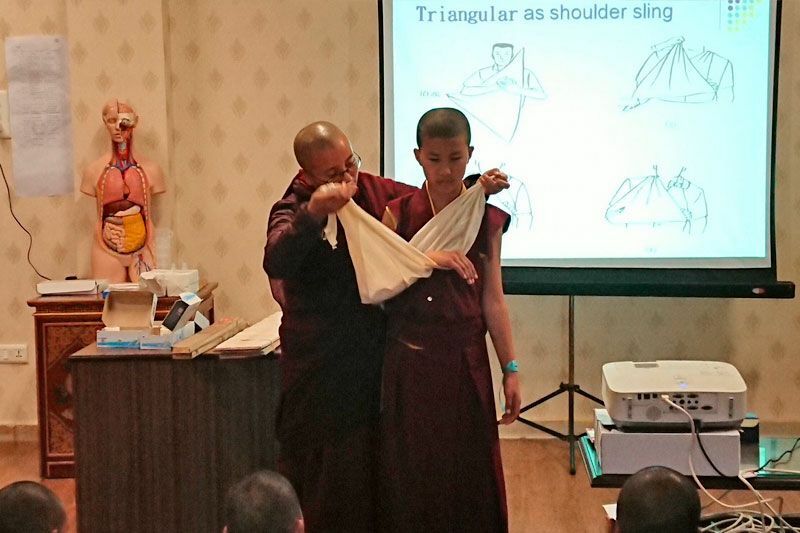 “I have met and worked with so many wonderful Dharma brothers and sisters at the Kagyu Monlam and I am really grateful to be involved with the Compassion in Action Projects. This year when His Eminence Gyaltsab Rinpoche gave teachings reminding us that all beings have been our parents and our children, he also encouraged us to use the small beneficial acts that we can accomplish as a support for developing vast aspirations. This was the perfect preparation before going to work at the Soup Kitchen each day. I hope that we brought some moments of light into the really difficult lives of the people we served and that we will be of even greater benefit to them in future”.